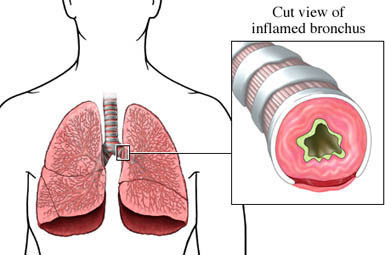 Asthma is a chronic inflammatory disease that affects the lining of the airways. In some cases, it is also a chronic allergic condition. The airways become swollen from inflammation and narrowed from muscle contractions. They also produce extra mucus. Episodes of worsening asthma called asthma attacks occur when the narrowing worsens. During an asthma attack, symptoms may range from a mild whistling or hissing sound as you breathe to severe obstruction of the airways, potentially causing a life-threatening inability to breathe. Cough-variant asthma begins as persistent, chronic cough without shortness of breath. Although asthma can be serious, there are many ways to prevent and control symptoms. The underlying cause of asthma is two part: 1) inflammation in the lining of the lung, and 2) structural changes in the lung due to inflammation and narrowing of air passages. Factors in indoor and outdoor environments, called triggers, can make asthma symptoms worse and cause asthma attacks in people who have asthma. What are the risk factors for asthma?What are the symptoms of asthma?How is asthma diagnosed?What are the treatments for asthma?Are there screening tests for asthma?How can I reduce my risk of asthma?What questions should I ask my doctor?What is it like for a child to live with asthma?What is it like for an adult to live with asthma?Where can I get more information about asthma? Asthma. American Lung Association website. Available at: http://www.lung.org/lung-health-and-diseases/lung-disease-lookup/asthma. Accessed September 8, 2017. Asthma exacerbation in adults and adolescents. EBSCO DynaMed Plus website. Available at: http://www.dynamed.com/topics/dmp~AN~T114076/Asthma-exacerbation-in-adults-and-adolescents . Updated January 13, 2017. Accessed September 8, 2017. Asthma exacerbation in children. EBSCO DynaMed Plus website. Available at: http://www.dynamed.com/topics/dmp~AN~T241915/Asthma-exacerbation-in-children . Updated January 5, 2017. Accessed September 8, 2017. Asthma in adults and adolescents. EBSCO DynaMed Plus website. Available at: http://www.dynamed.com/topics/dmp~AN~T114449/Asthma-in-adults-and-adolescents . Updated February 22, 2017. Accessed September 8, 2017. Asthma overview. American Academy of Allergy Asthma & Immunology website. Available at: http://www.aaaai.org/conditions-and-treatments/asthma. Accessed September 8, 2017. Asthma overview. Asthma and Allergy Foundation of America website. Available at: http://www.aafa.org/display.cfm?id=8&amp;sub=14. Updated October 2015. Accessed September 8, 2017.